Pictures often speak louder than words, and if you take a look at the way-finding symbols that surround any given urban area, you’ll see how visual representations reach beyond cultural and language barriers, communicating ideas instantly. The Noun Project has been building a catalog of these types of symbols for quite a while now, and just last week it released new features to its site that let you to see the most popular symbols, watch real-time downloads and browse recent submissions. 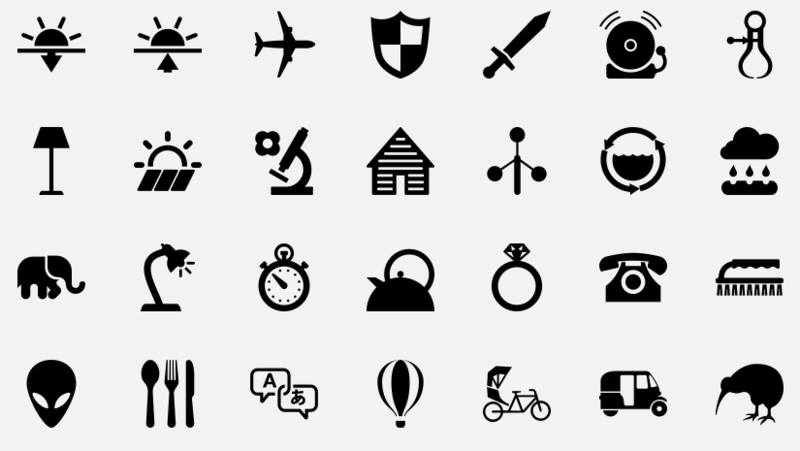 If you have never heard of The Noun Project, all you need to do is imagine hundreds of gorgeous black and white symbols that are completely free for anyone to use. You may call these symbols pictographs or icons, but no matter what, they undoubtedly help the world communicate important objects and concepts — all for free. Since it’s free and readily available, It’s easy to imagine how much of a goldmine this can be for designers. The entire directory is up for grabs to use in your own projects, and you’re also welcome to join the project and submit your own designs. Highly recognizable symbols certainly aren’t perfect for every job, but if you take a second to browse the different categories, you’ll find everything from food and animals to tech and communication. There’s so much variety and diversity here that you’re bound to find something useful — no matter what project you may be working on (logos, icons, navigation, etc.). These symbols might be the perfect starting point you need to make something amazing. Check out the collection, get inspired and feel free to change, manipulate and mess with whatever you find. Let us know what you think in the comments below! Also, you might want to check out Pictos, a Typekit for your UI.